This article analyses the impact of different types of corporate financial restructuring measures on shareholder wealth creation based on some selected cases. Analysed cases suggest that commonly used measures like share buybacks have not been found to be value-accretive in contrast to divestitures which generate significant shareholder value. Corporate restructuring is the fundamental change in a company's business or financial structure with the motive of increasing the company's value to shareholders or creditors. Corporate restructuring is broadly divided into two parts: financial restructuring and operational restructuring. While financial restructuring relates to changes in the capital structure of the firm, operational restructuring relates to changes in the business model of a firm, with the aim of increasing overall shareholder value. Chief Financial Officers (CFOs) today have an array of options to choose from when it comes to corporate financial restructuring. This article will focus on the financial restructuring - i.e. restructuring the assets and liabilities of corporations in line with their cash flow needs - and evaluate the different options by looking at past cases. We consider three main areas of financial restructuring - share buybacks, demergers and debt reduction. In a share buyback program, the company distributes the excess cash flow among the shareholders. The shareholders get an exit opportunity at a premium price (in most cases) over the prevailing market price, while the company gets an opportunity to reduce its equity capital liability. Some of the prominent reasons of share buyback are boosting market perception, showing rosier financials, benefitting from tax gains and increasing the promoter's stake if the share price is low or there is a takeover threat. Exhibit 1 shows the results of the share buyback analysis. The bottom row presents the rate of return seen by share buybacks over a few cases. Share buybacks in India send mixed signals to investors deciding whether to participate in the buyback program or not. While buybacks as a whole have helped boost returns to investors as a class, companies motives for undertaking them are not always very clear, which feeds through to the dubious returns. Mergers and acquisitions (M&A) refer to the aspect of corporate strategy dealing with the buying, selling and combining of companies that can aid, finance, or help a growing company in a given industry to grow rapidly without having to create another business entity. The focus in this article is on demergers, also known as spin offs. In a demerger, a firm is broken up into two or more independent entities through an initial public offering ("IPO") of a subsidiary, with the shares of the new company being distributed to the shareholders of the parent company on a pro-rata basis. A demerger is a sensible option if negative synergies or diseconomies of scale exist, which can be eliminated by separating the firm. Any surplus generated from operating activities over and above the cost of capital is termed as Economic Value Added (EVA). It is used by companies as a performance indicator1 and is better than return on Investment (ROI). ROI measure is ambiguous while EVA is practical and understandable. 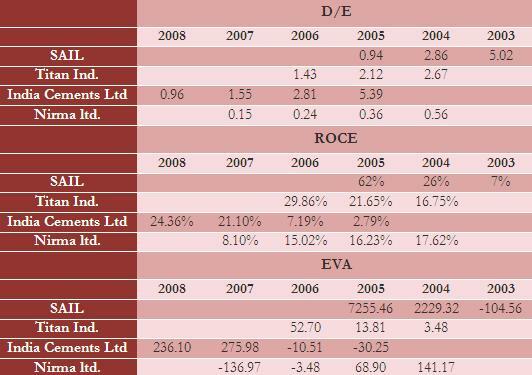 Increase in ROI is not necessarily good for shareholders while increase in EVA is always good. Case Study: Dabur India Ltd.
Exhibit 2 shows the results of the demerger analysis for Dabur India Ltd. The Dabur FMCG business unlocked value for shareholders, since the EVA of the FMCG business was more than that of composite business. Dabur Pharma had a negative EVA, clearly indicating its capital was not properly used in the composite company. The total EVA of the FMCG and Pharma division was lesser than that of composite business indicating a negative synergy was present between the two divisions. 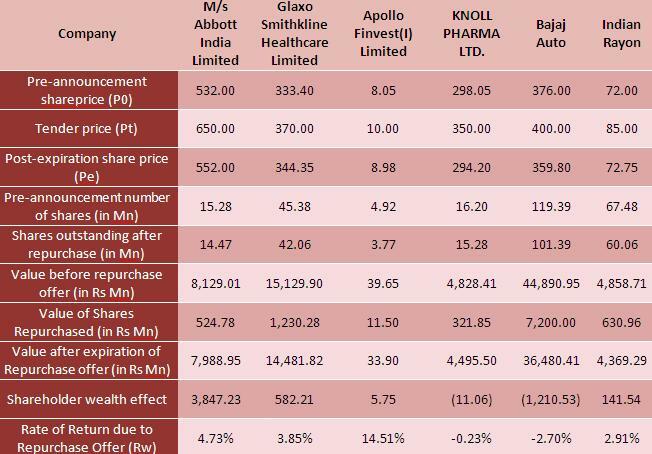 The EVA disparity between the demerged units is expected as FMCG and Pharma are two distinctly different businesses - where FMCG is a low capital intensity business, the pharmaceutical business requires higher capital due to R&D activities. Case Study: Bajaj Auto Ltd. The Board of Directors of Bajaj Auto Ltd agreed to a demerger on 17th May 2007. Under the scheme, BAL, the parent company, would be renamed as Bajaj Holdings and Investment Ltd ("BHIL") and the business was to be demerged into two new incorporated subsidiaries - Bajaj Auto Ltd ("BAL") and Bajaj Finserv Ltd ("BFL"). The auto and manufacturing businesses of the company would be held by BHIL while the wind power project, investments in the insurance companies and consumer finance would go to BFL. All the shareholders of the parent company became shareholders in the new companies and were issued shares of the two new companies in the ratio 1:1. 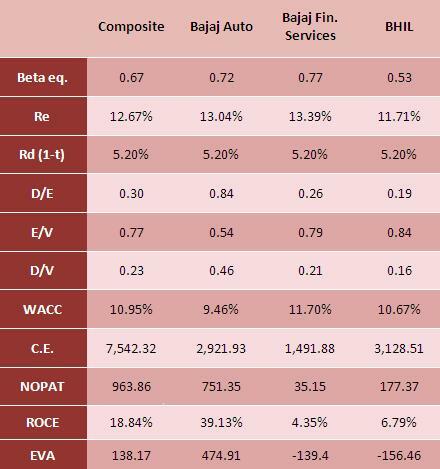 Exhibit 3 shows the results of the demerger analysis for Bajaj Auto Ltd. Both these cases highlight that demergers can unlock significant shareholder value. The markets also reacted positively, with both scrips appreciating when the news of the demerger broke out. Debt restructuring is a process that allows company facing cash flow problems and financial distress, to reduce and renegotiate its delinquent debts in order to improve or restore liquidity and rehabilitate so that it can continue its operations. A debt restructuring is usually a less expensive and more preferable alternative to bankruptcy. The major reasons for debt reduction are maintaining healthy debt/equity ratio, reducing high interest costs and utilising cash reserves. The results of the four companies' analysis of their debt reduction are summed up in the following Exhibit. Debt reduction below a certain level is not beneficial to the shareholders & to the company because of operational inefficiencies of the company, causing its EVA to also gradually decrease. Debt has one intrinsic benefit for corporates - by reducing the tax burden, it increases net profit for the company, thereby creating more value for shareholders. It can be seen that merely reducing debt with cash surplus will not necessary be good for the shareholders. It can, in fact have a negative impact on company's profitability as it increases the tax burden for the company. Amongst the plethora of corporate financial restructuring options available to CFOs today, not all are equally value accretive. This article shows that share buybacks, a commonly used mechanism, often yield poor returns and are not favoured by investors. Divestitures have been shown to generate shareholder value for conglomerates when done correctly - certainly good news for a lot of Indian corporates who have diverse business interests. Finally, debt reduction is an equally viable alternative, but it suffers from diminishing returns and should be done incrementally only after careful analysis.